I have been a client at Vinissimo shop since they were still located in Livange and now they opened the door in the huge premise of Cloche D’Or is almost a weekly appointment for charcuterie, cheese and wine tasting. Before holidays, I had a very nice lunch at the restaurant in their premise (Divino) with Patricia, so I was really excited when my friend Anna told me she booked there for one of our usual dinners. Unfortunately, even if the food was (almost) great, I did not like so much the place in the dinner atmosphere – later I will explain why. We shared a charcuterie platter and, as main, I went for gnocchi with gorgonzola cheese while Anna had a pizza. We drank a Nebbiolo Gattinara 2008 and concluded with coffee and a digestif made with red Oranges. After the picture you will find my impressions about the dinner. Charcuterie is unbeatable. 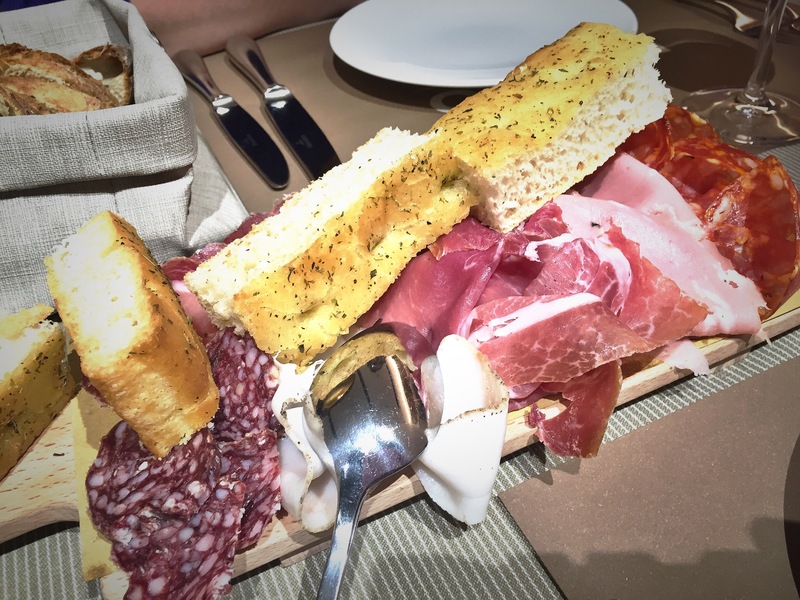 The small platter was actually huge and the selection very interesting (lardo di Colonnata, liver salami, crudo ham, mortadella and focaccia). Service is great. Waiters are available, smiling, always on side. Wine was decanted and we never had empty glasses. The location is not impressive. While at lunch time it might appear good to eat in the middle of a shop, during the evening lights are too strong and tables really too close – our neighbors were less than one hand from us. The food missed the spark. 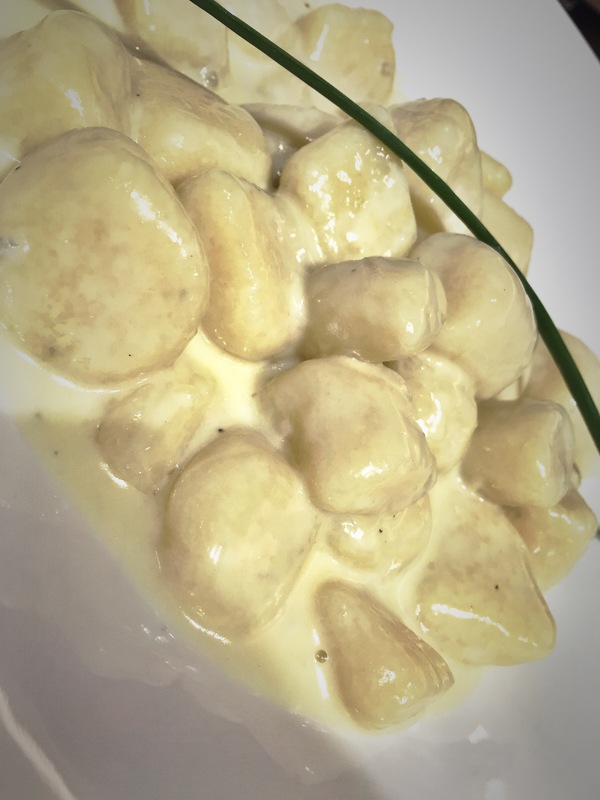 My gnocchi were one of the plainest dish I had in a long time. I appreciated they were really home-made (first place in Luxembourg probably), but were totally missing taste. Anna’s pizza was very disappointing – and the charcuterie or cheese you can order with the pizza are on side not on top. In conclusion: Divino is a very good alternative for an upgraded lunch if you are in Gasperich or want to go out from the busy center (huge parking available). The mixed charcuterie and cheese platters are exceptional and you can combine them with great wines. 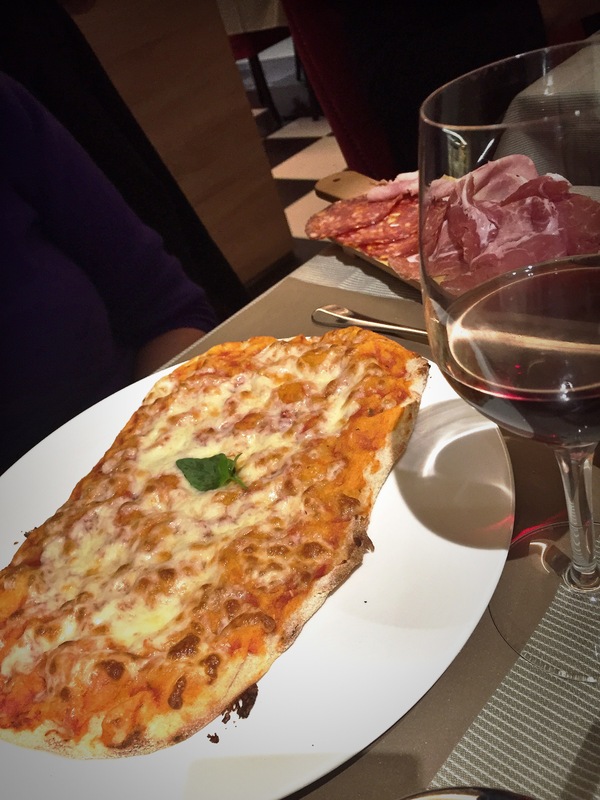 I would anyway not come back for a proper dinner as spaces is too small, lack of atmosphere and not all the food options are remarkable (avoid the gnocchi and the pizza, go for Paccheri with Rabbit ). I think it is time to visit this restaurant! Thanks for posting I love the way you write your reviews.